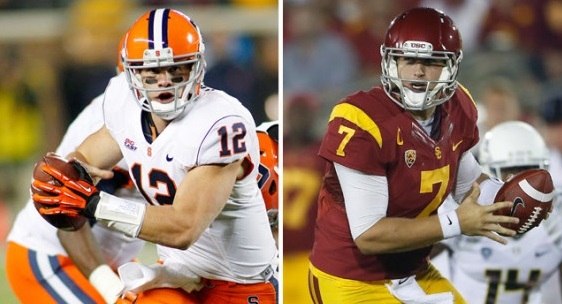 When will Ryan Nassib and Matt Barkley get drafted? Now if you told me that only three quarterbacks were selected in the first two nights of the 2013 NFL Draft, I would have raised my eyebrows. If you told me that neither Ryan Nassib of Syracuse nor Matt Barkley of USC were among them, my eyebrows would have fallen off. And yet, that is where we are as we enter the third day of the draft on Saturday at noon, both quarterbacks remain on the board as we kick off the fourth round. So when will these quarterbacks get drafted? Both quarterbacks have been hurt by a weak class at their position. Everybody knew going in that there was not that surefire franchise quarterback and thus many of the teams that need quarterbacks have waited and sat on their hands. Now the question is that if they have passed over said guy so many times already, what makes it so sure that they will pick that prospect at some point. 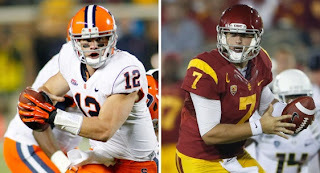 And what could potentially hurt both Nassib and Barkley is that as we head into the middle rounds of the draft, more and more quarterbacks are viable options. Take for example Arizona's Matt Scott, who really has not been considered a first or second day prospect, but is expected by some to be selected by the Eagles at pick 101. I do think both Nassib and Barkley will still go early in the day, then again, I thought that about both on Friday. Eventually, you have to think that the Jaguars are going to take a quarterback, nobody is buying their "faith" in Blaine Gabbert. How confident is Oakland that Matt Flynn really is their guy, and didn't Seattle say the same thing? Arizona has to know that Carson Palmer is no spring chicken, right? Is the new brass in Cleveland sold on Brandon Weeden? And since nobody saw Tampa Bay taking Mike Glennon coming, could somebody pull a surprise? If you put a gun to my head, I would say that Jacksonville will see the light and take Nassib with the first selection today, and while Barkley is a tougher guess but I still think he will land in Oakland. Don't put it to the bank, but hey.